Brand New for Christmas is this special StormForce 10.8v Homeowner Kit. 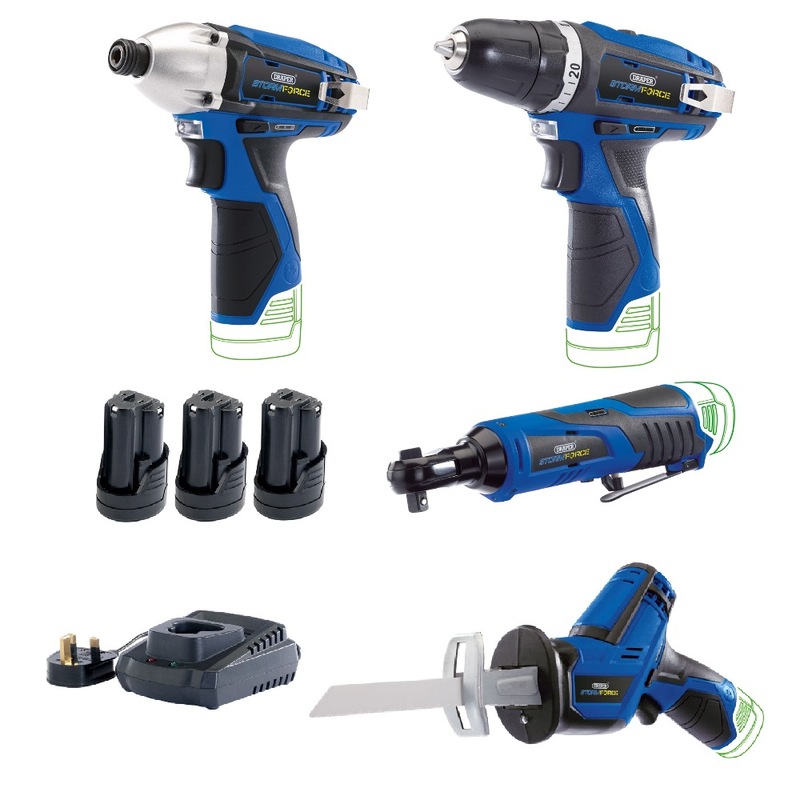 The brilliant Draper 16048 10.8v Cordless Hammer Drill (in a carry case) with two batteries and a charger. 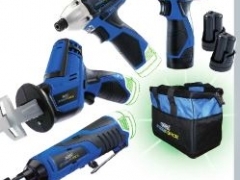 Then we are adding a third Draper 16254 Battery and bundling everything together into a Draper StormForce Tool Bag to create this fantastic value homeowners 10.8v Cordless Kit. 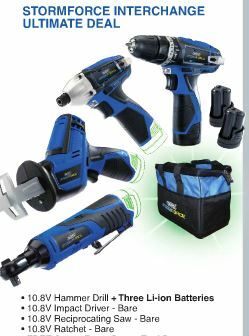 Storm Force cordless hammer drill fitted with a powerful 25Nm variable speed motor with 21 torque control positions and three functions; drill, hammer drill and screwdriver. Fitted with a sturdy 10mm keyless chuck, super bright LED worklight, metal belt clip and a battery level indicator. Supplied with two impressive 10.8V - 1.5Ah lithium powered batteries, one-hour quick charger and a heavy duty carry case. Storm Force cordless impact driver. Achieves a powerful 80Nm of torque capable of delivering an impact rate of 3500 per minute. Fitted with a 1/4" quick release collet, forward reverse facility, super bright LED worklight and a battery level indicator. Storm Force 3/8” cordless ratchet. Achieves a powerful 45Nm and fitted with a forward reverse facility, super bright LED worklight and a battery level indicator. Storm Force cordless reciprocating saw capable of delivering a 14.5mm stroke length. Fitted with a variable speed motor, quick blade change system, super bright LED worklight and a battery level indicator.